They were met with a huge banner at the gate. 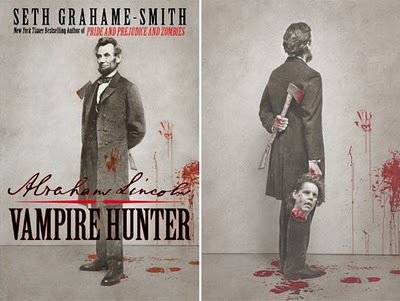 It had the title treatment of the script and was emblazoned, “Tim Burton and Timur Bekmambetov present Abraham Lincoln: Vampire Hunter“. At their parking spot were signs saying “Parking For Vampire Hunters Only: park at your own risk,” and so forth. There were bloody footprints lining the walkway and stairs leading from their cars to the meeting in Building 88 with images from the book and lines from the script. As if that were not enough, there also were bloody axes strewn about, and a bugle player in a Confederate uniform playing Taps as the filmmakers walked to the meeting. I can see how that might impress… but surely the actual deal being offered was the best one? This can’t have come down to a little bit of camp and some flattering effort, can it? We may never know. The film is likely to start rolling in the spring. 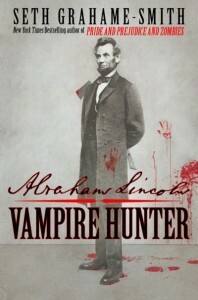 I'm reading: HOW [TIM BURTON] SEDUCED FOX INTO SECURING [ABRAHAM LINCOLN: VAMPIRE HUNTER] WITH BLOODTweet this!